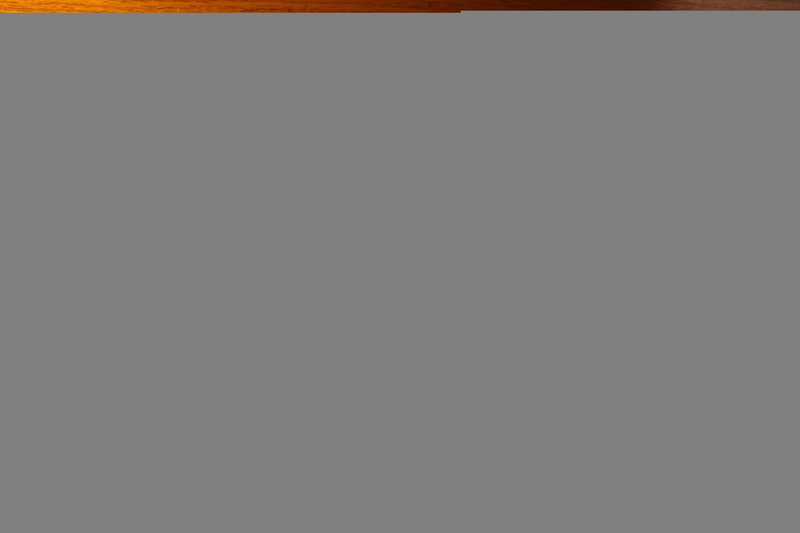 This time of year is known as the Back To School period of the year around the country, and though I graduated college seven years ago, it seems as though I can be counted among those who will soon be heading to class for some education. 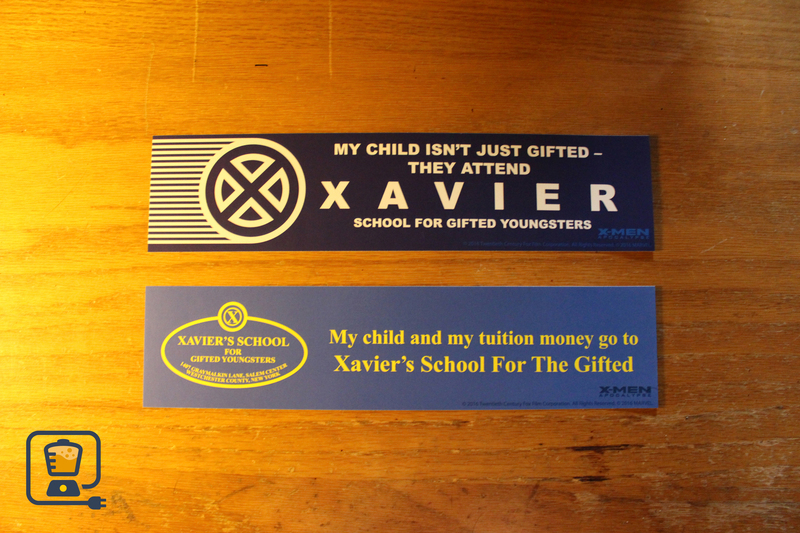 This is because I recently got some great news in the mail: I got accepted to Xavier's School For Gifted Youngsters! 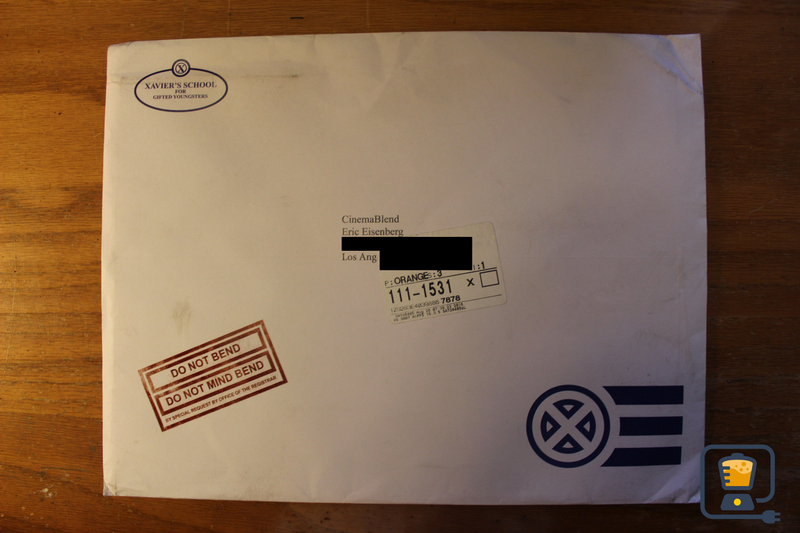 As you'll see in the rest of this article, the coolest thing about this X-Men: Apocalypse mailer is the incredible level of detail - and it's even part of the packaging. 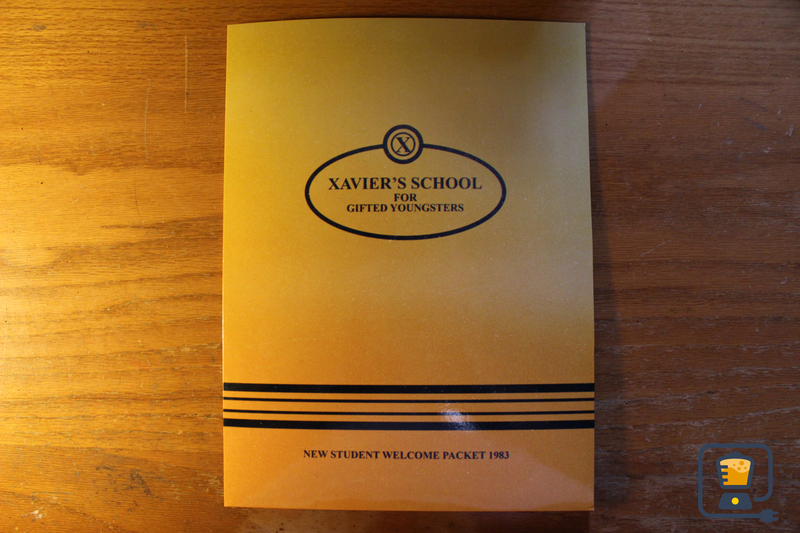 A major school wouldn't send information to students in an unbranded envelope, so Xavier's School For Gifted Mutants doesn't either! Fortunately mutants are well accepted in the world following the timeline-changing events of X-Men: Days of Future Past, so I don't think I have to worry about my mailman bringing harm to me by exposing my special abilities to the world. 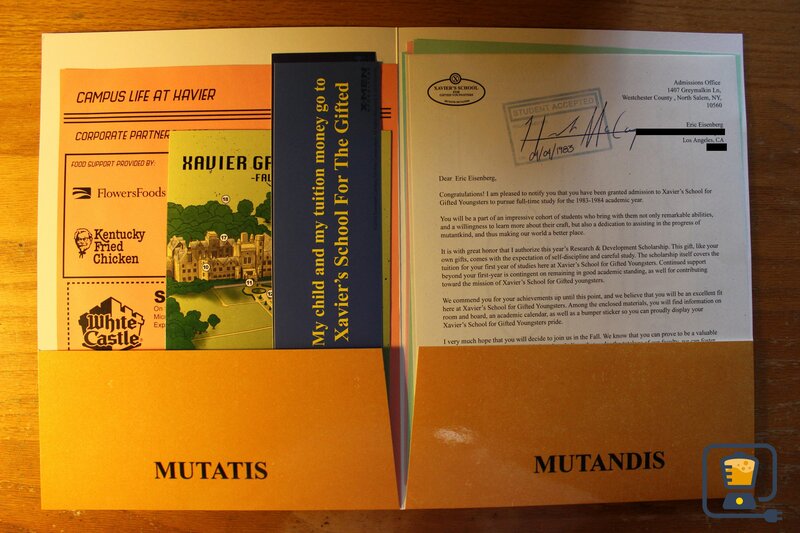 All of the contents in the mailer were included in this nice glossy folder from Xavier's School For Gifted Mutants. As you can see at the bottom, I've been accepted to be a part of the Class of 1983, which is the year X-Men: Apocalypse is set. It also happens to be a few years before my birth, but we'll just look past that particular detail. Here's what it looks like when the folder is open. I'll be taking a closer look at all of the content below, so let's now focus on that Latin at the bottom, shall we? "Mutatis Mutandis" doesn't really have anything to do with mutants/Homo superior, but instead is a classic phrase that means "the necessary changes having been made." I suppose that's probably a reference to the change that mutants undergo when their powers manifest. Stamped and approved by Hank McCoy a.k.a. 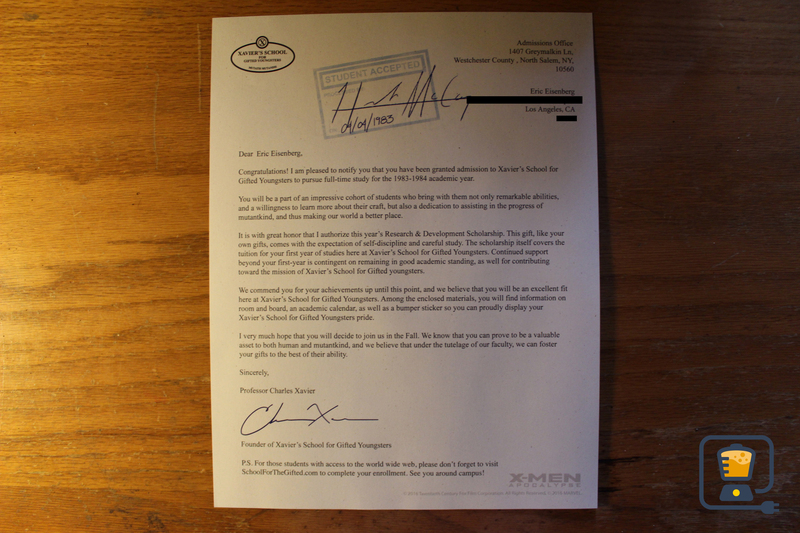 Beast and penned by Professor Charles Xavier himself, this is my personal acceptance letter into Xavier's School For Gifted Mutants. It comes with great news on beyond my access to the special program in Upstate New York, as its been confirmed that I've actually earned a Research & Development Scholarship. In what field? Head on down to the next image! 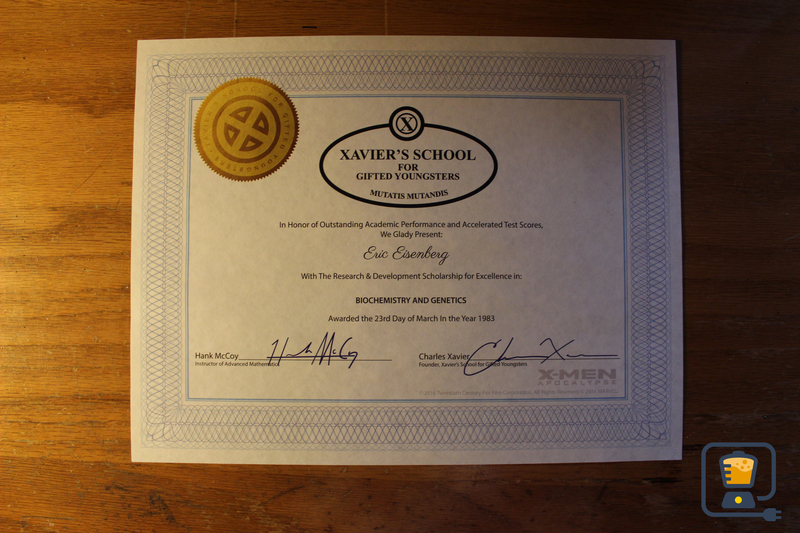 While in reality my abilities have always been stronger in the English/History departments, it seems that Xavier's School For Gifted Youngsters is primarily interested in my achievements in the field of science. My Research & Development Scholarship has been rewarded for my work in biochemistry and genetics, which I guess was an interest spurred on by my own mutation. It turns out that my time in residency at the X-Mansion won't be alone. Instead, as the form above notes, all Freshmen at Xavier's School For Gifted Youngsters are required to live with roommates. Like most schools, this is presumably to ensure a good start to my social life on campus. You'll notice that an option to be in a room looking over the basketball courts is no longer possible - and that probably has something to do with the fact that it opens up so that the X-Men's Blackbird can take off. Head to the next page to see more! 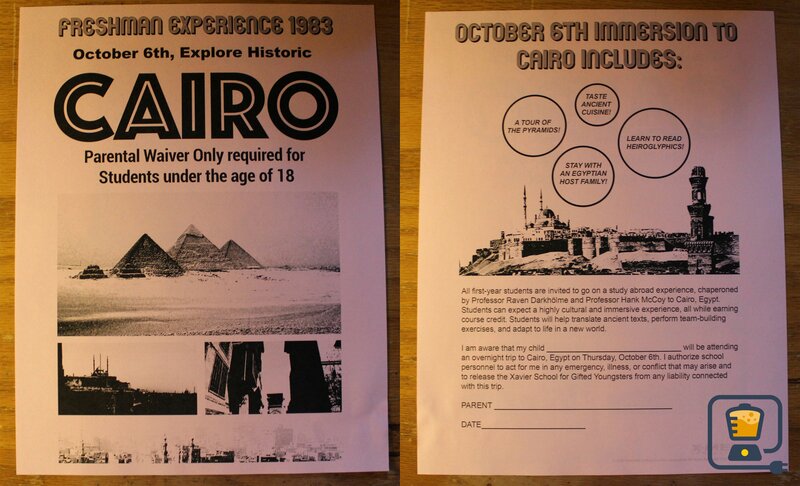 The events of X-Men: Apocalypse center around some seriously bad stuff going down in Egypt... which is coincidental since Cairo happens to be the location of the big Freshmen trip that is being offered to students in the first semester. It seems like it could be pretty dangerous, but given the fact that Professor Raven Darkholme a.k.a. Mystique and Professor Hank McCoy will be chaperoning, I think it will be pretty safe. Speaking of upcoming events, there's a full slate of them that will be taking place on campus and will be available for students at Xavier's School For Gifted Youngsters. You'll notice "National Cherry Jubilees Days" on September 24th (which I'm sure Jubilee will enjoy), and also Dr. Moira MacTaggert will be be in Upstate New York on October 12th for a special lecture called "Bridging Humans and Mutant Affairs." There's also some interesting stuff going down on September 9th and October 4th that you should probably check out. Not everything in the admissions folder for Xavier's School For Gifted Youngsters is actually for me. 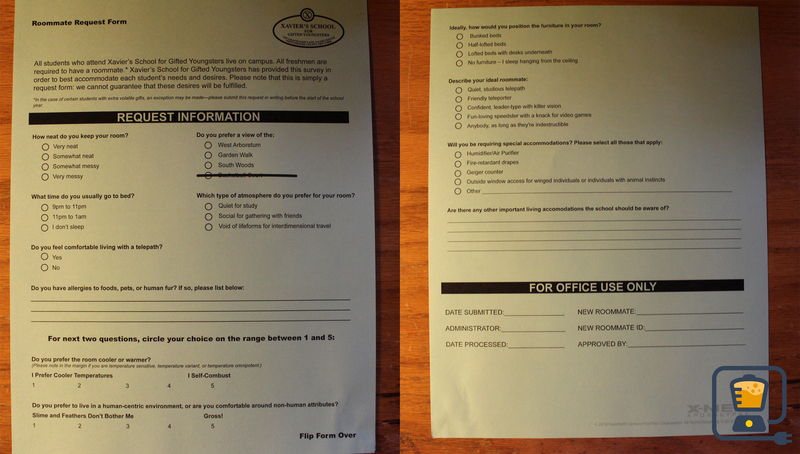 Instead, it seems that I'll have to mail these out to my parents. After all, I'm sure that they'll want to demonstrate how proud they are of me and my acceptance into Professor Charles Xavier's esteemed school. If you're out and see these on a car somewhere, I'd give the driver a thumbs up. Professor Charles Xavier's childhood home is a rather expansive mansion, so it will be very helpful to have this map of the grounds when I arrive in Upstate New York. As you can see, there is a whole lot to do both inside and outside of the school, from the archery range and pond to the movie theater. You'll notice that neither the Danger Room nor Cerebro show up on this map, but those locations are surely off limits to students anyway. 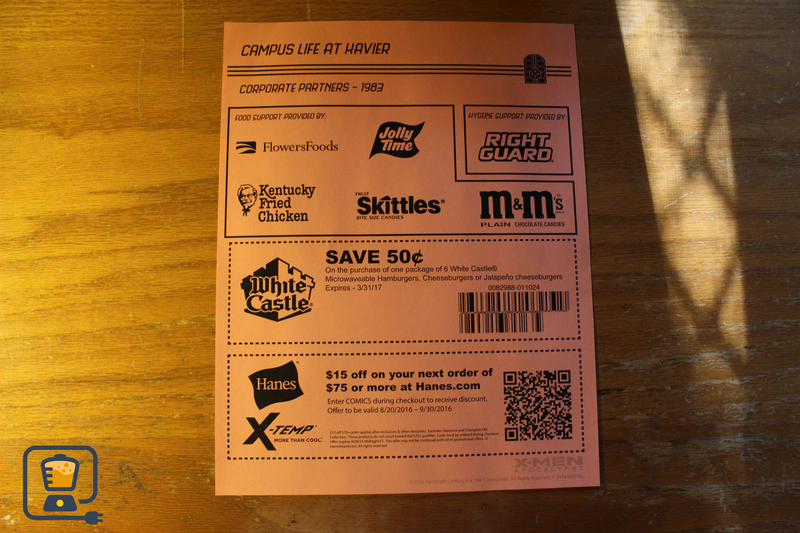 Lastly, we have a coupon page that I suppose is meant to help me get a bit better acquainted with life at Xavier's School For Gifted Youngsters. The particular bonuses include being able to save 50 cents off an order at White Castle, and money off at Hanes.com (how there was a Hanes.com back in 1983 I'm not 100% sure, but it's fine). While I pack my bags and get ready to head back to school, you all can get ready for X-Men: Apocalypse to arrive in Digital HD on September 9th and Blu-ray/DVD on October 4th.